Members of the Civil War re-enacting group, the Third Michigan Volunteer Infantry Co. F, portrayed a period wedding at last year's Zeeland Historical Society's Historical Home Tour. Historic homes, Civil War re-enactors, music, food, and American flags will be on display June 14 during the fifth annual Zeeland Historical Society's Historical Home Tour. This year's tour, themed for Flag Day, will be held from 10 a.m. to 3:30 p.m. and features eight area homes built between 1889 and 1923. The proceeds from the home tour will go toward the New Groningen schoolhouse renovation project. Tourgoers will begin the day at the Zeeland Historical Society/Dekker Huis Museum, at 37 E. Main Ave., by picking up brochures with information on the featured homes. Rides will be offered in vintage cars to home destinations. Between 450 to 550 people are expected to take the tour with about 130 volunteers helping put on the event, said Anna Van Deventer, the museum director. She described the homes chosen for this year's tour as beautiful and historic. She highlighted the home of Philip and Annica Waalkes, located at 122 E. Central Ave.
Ed VanLopik, owner of the former Ted and Ed's clothing store downtown, originally built the home in 1899. 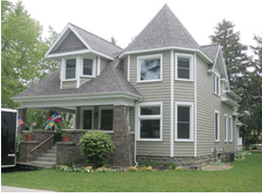 The Waalkes, along with their three children, bought the home in 2006 and have overseen extensive renovations. "The whole house has been touched," said Philip Waalkes, adding one-third of the house was removed during the remodeling project. Waalkes said the home, originally 2,400 square feet, has been expanded to 4,000 square feet. He said the kitchen and downstairs bathroom has been entirely remodeled, two new bathrooms have been added, the dining room and family room have been renovated, and the siding has been replaced with fuel-efficient vinyl siding. Waalkes, who purchased the home after moving to Zeeland from South Carolina, said he and his family had always planned to remodel. He said his goal has been to maintain the look and style that came with the historical house. He said just a few finishing touches are needed before the remodeling project is complete. "It should be ready for the home tour," he said. "I'm really excited." Van Deventer said all the work done to the Waalkes's home should draw a lot of attention from tour participants. She said Bradley and Christy VerBeek's house at 33 E. Central Ave., built between 1926 and 1927, also will attract interest. The couple bought the home in 2007. They have worked to restore the house to its original grandeur and turned the unfinished attic into a livable space. * Blaine and Kristy Knoll's house at 425 E. Central Ave., a craftsman bungalow constructed in 1922. Other buildings on the tour are the Parkview Adult Foster Care Home, built at 214 E. Central Ave. in 1899 by Henry DeKruif, and the former New Groningen schoolhouse, in use from 1881 to 1951 on Paw Paw Drive. American flags will line the streets along the tour in celebration of Flag Day. The tour also will include a re-enactor portraying Betsy Ross, who will be sewing the first American flag. Other re-enactors will take part in a Victorian tea, Civil War funeral, and presidential debate between Abraham Lincoln and Jefferson Davis. The tour will feature Dutch desserts and drinks, music, and artists as well. New this year will be an art contest held at the museum. Local artists can submit their adaptations of the American flag with a $100 prize for first place, $50 for second place and $25 for third. Artwork must be turned into the staff at the museum by 2 p.m., June 7. Tickets are $22 in advance or $25 the day of the tour. Advance tickets are available at the Zeeland Chamber of Commerce, Sweet Bean, Zeeland Hardware, and Bunte's Pharmacy, all located in downtown Zeeland. Civil War re-enactors will play a large role in the Zeeland Historical Society's Historical Home Tour. About 25 re-enactors from around West Michigan will bring their knowledge of the Civil War era and, in first person, perform a Victorian tea, Civil War funeral, and presidential debate between Abraham Lincoln and Jefferson Davis during the home tour set for June 14. Members of the Third Michigan Volunteer Infantry Co. F, based in Grand Rapids, will take part in the Victorian tea and funeral. The group participated in last year's home tour, celebrating a period wedding. Lollie Baumann, a Zeeland resident and re-enactor, said the group is made up of history buffs who have knowledge of the Civil War as well as take the time to research the past in order to correctly represent events. Baumann is as the group's civilian coordinator and her husband Dave is captain. She said, for example, in last year's wedding the bride and groom couldn't touch or kiss and didn't exchange rings, which followed the customs of the time. For this year's tour, ladies will gather on the lawn of the home at 120 S. Church St. for an authentic 18th century tea, held at 11 a.m. and 1 p.m. A funeral for a young Civil War soldier will be held at 11:30 a.m. and 1:30 p.m. at 155 S. Church St. Baumann, in a black mourning dress, will participate in the funeral. With research, the re-enactors learned mirrors in the deceased soldier's home were covered and they created a pine wooden casket for the soldier. A re-enactor will portray Betsy Ross sewing an American flag at the Knoll's home at 425 E. Central Ave. Re-enactors also will play the roles of Abraham Lincoln and Jefferson Davis in a presidential debate at the Vande Luyster Square at 12:15 and 2:15 p.m. Tourgoers can ask the re-enactors questions about the time period after the debate. Baumann said her group is excited to be a part of the home tour and especially enjoys their time in Zeeland. The members also take part in the military timeline during Pumpkinfest. "We enjoy portraying living history," she said.